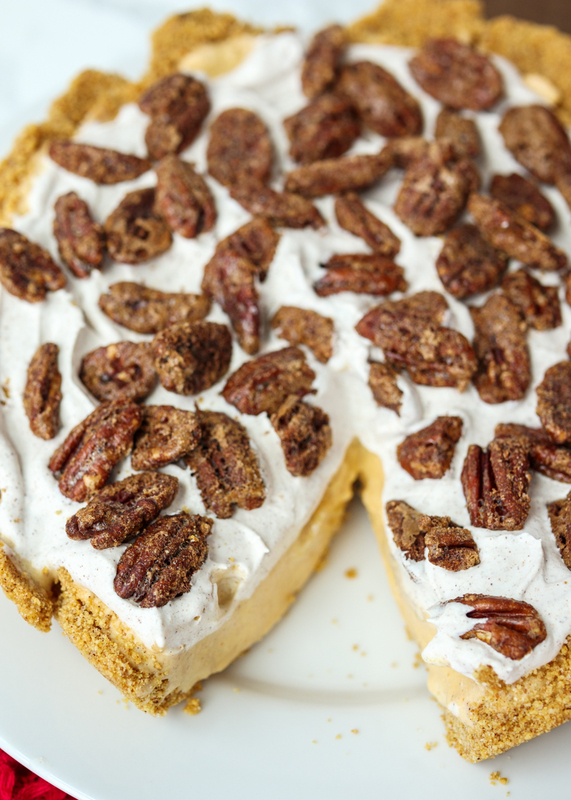 Pumpkin Pecan Ice Cream Pie went down in the Lemon & Mocha kitchen and it was as amazing as it sounds (and looks)! When I was brainstorming what desserts I wanted to share for Thanksgiving I knew I was going to make the Pumpkin Cheesecake Trifle, but I wasn’t sure about my second dessert. Usually for Thanksgiving everyone immediately thinks of pie and my pie-loving husband has converted me into a pie fan over the years. I don’t like to share recipes on Lemon & Mocha that I’m not 100% satisfied with and while I have made a bunch of really great tasting pies, I wouldn’t say I’ve perfected them yet. However, there is one type of pie I have perfected, if I say so myself, and that is ice cream pie. I have made many, many ice cream pies over the years and I’ve shared a few on here as well, although not nearly enough! I’ll work that into the schedule for 2019. Graham crust, cookie crust, ganache-topped, candy filled, cake filled – you name it, I’ve whipped it up. I may have even eaten a slice or two. Clearly I’m kidding, many, many slices have been consumed, all in the pursuit of perfection though. 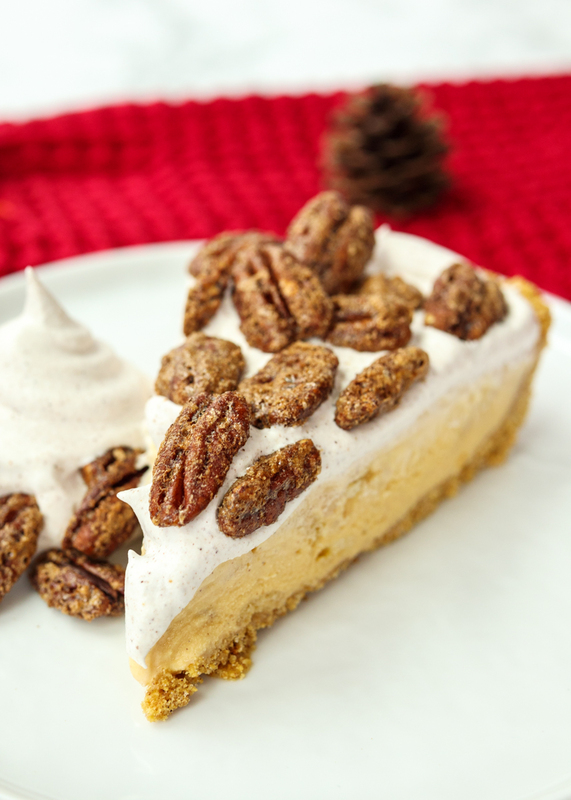 This Pumpkin Pecan Ice Cream Pie is a nice break from the traditional Thanksgiving dessert table and the big bonus is that it’s so easy. Like so easy I even waited until the week of Thanksgiving to share it because you barely need any time to put it together. Although it is quick to make, it does require at least eight hours of freezing time so definitely read the instructions all the way through and plan accordingly. 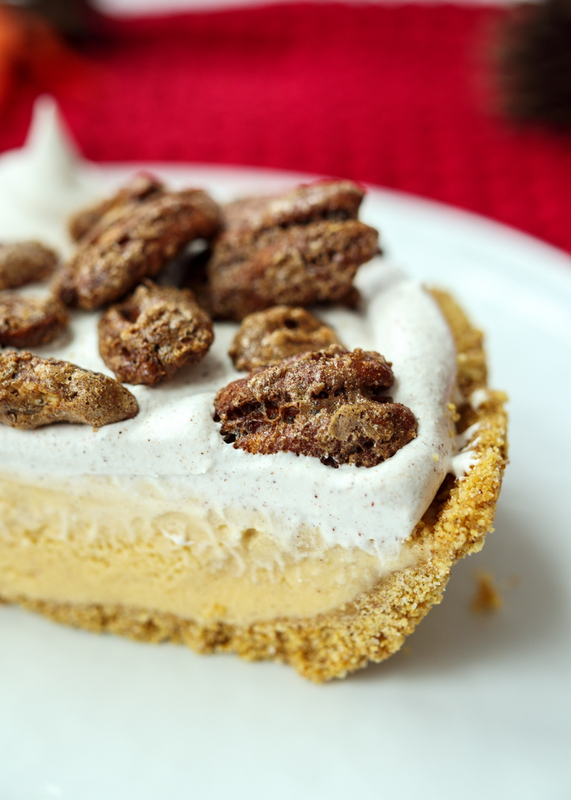 The base of this ice cream pie is a regular graham base with some cinnamon and ground ginger mixed in for that warm spiced holiday feel. Then we have pumpkin ice cream. You could certainly make your own and if you need a recipe I have had great success with all of David Lebovitz’s recipes from The Perfect Scoop. I had just come back from my vacation last week so I went the easy store-bought route, especially since so many brands have delicious-sounding pumpkin flavors right now. I bought the Talenti pumpkin gelato; it was really creamy, packed with rich pumpkin flavor and even had pie pieces in it – bonus! 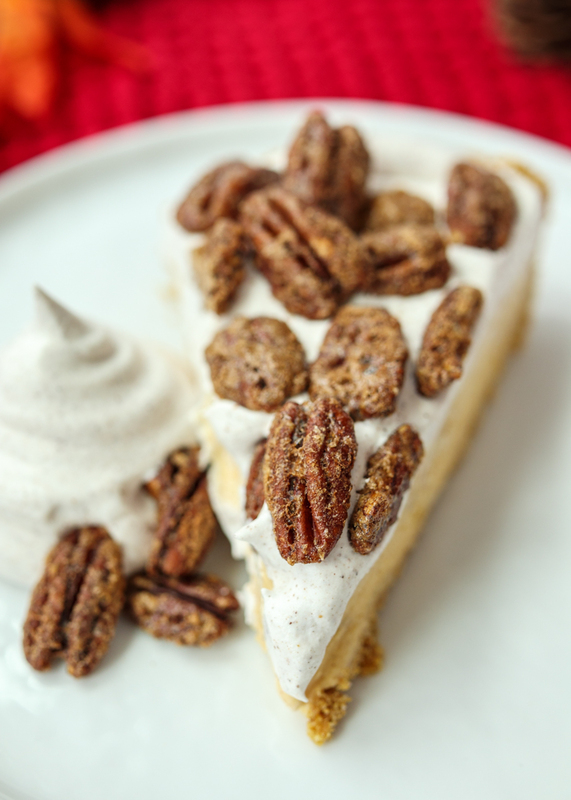 On top with have whipped cream and homemade sugared pecans. 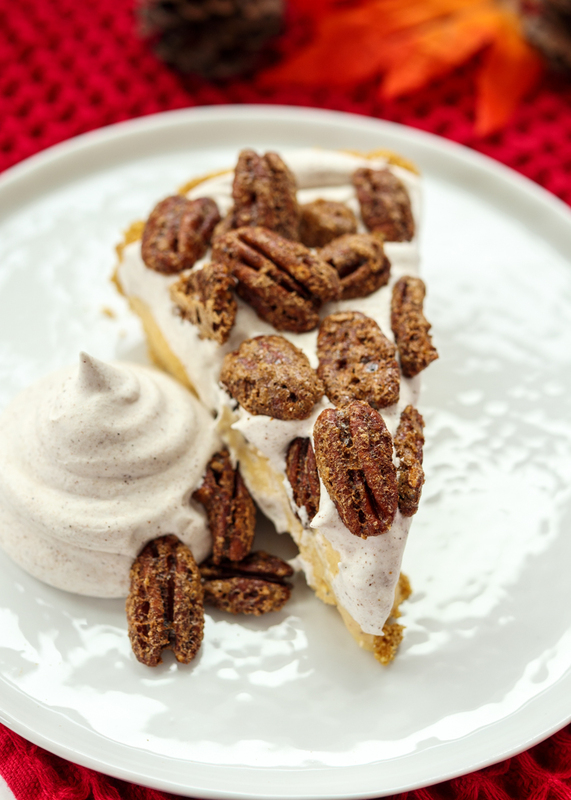 These pecans are tossed in egg whites and pumpkin pie spices then baked. They are so addictive, especially when they’re warm, so it was really difficult saving them for this pie! I find that ice cream tends to be a universal crowd pleaser and I know from experience there’s a lot of ice cream crazed families out there so this is the perfect Thanksgiving dessert. Although I highly recommend pumpkin ice cream you could certainly substitute a different ice cream flavor of your choice, just don’t skip those candied pecans! Enjoy! You have two pan options here. The first is a spring form pan lined with plastic wrap. Sometimes I like doing it this way so it’s easy to pop it out and put the pie on a cutting board for a nice even cut or onto a platter. The second option is to make the pie directly in a glass pie pan. If you’re doing option two (directly in the pie pan) and want a firmer crust bake the graham crust at 350 degrees F for 5 minutes then let cool completely before adding the ice cream. In a medium mixing bowl, combine the graham cracker crumbs, melted butter, the granulated sugar, the ground ginger and 1 teaspoon of the cinnamon. Pour into the prepared pie dish and press down with your fingers or the bottom of a measuring cup to make an even crust layer, going slightly up the sides of the pie dish. Don't go too high up or the crust on the bottom won't be thick enough. Put in the fridge for 2 hours or the freezer for 1 hour before the next step. Scoop the pumpkin ice cream or gelato into the graham crust. If you want to make the ice cream easier to spread, beat it with a stand mixer for a minute. Spread the ice cream into an even layer then let set in the freezer for 8 hours or overnight. 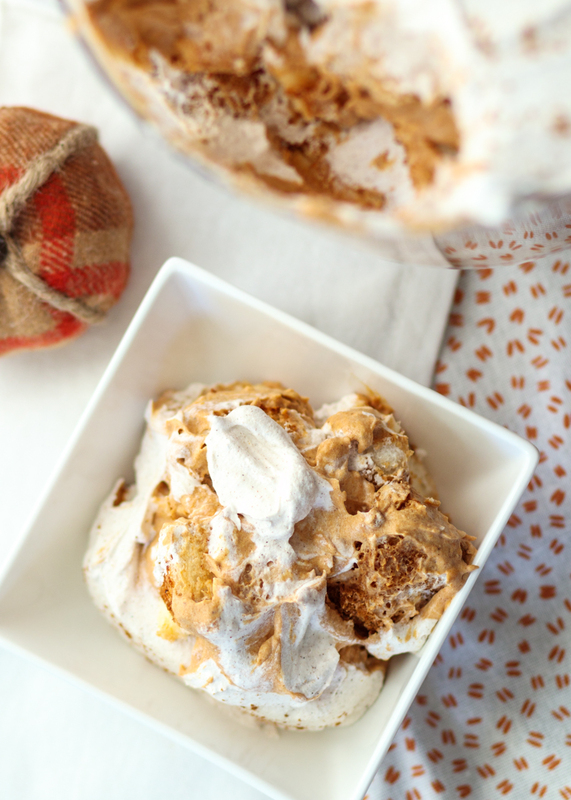 Combine the whipped topping with the remaining 1 teaspoon of ground cinnamon. 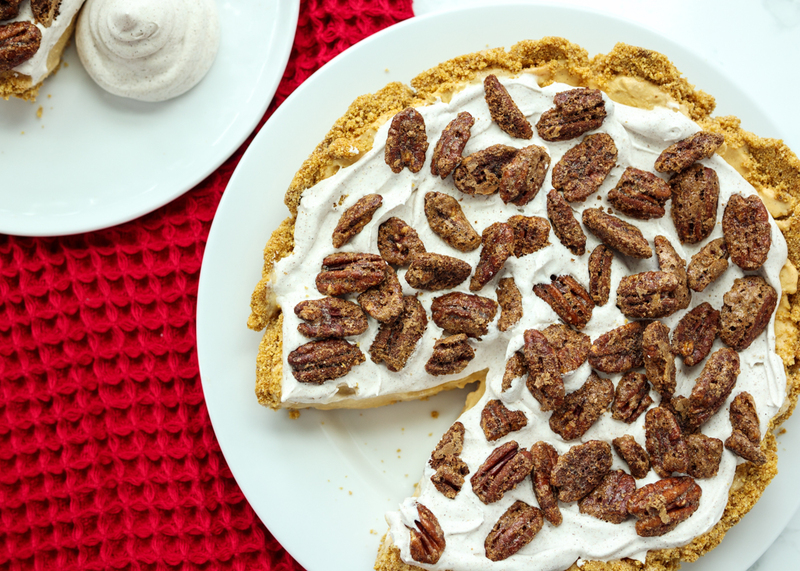 Spread on the firm ice cream pie. When you’re ready to serve, top with the pecan topping. In a small bowl, combine the brown sugar, granulated sugar, cinnamon and cloves. In a medium mixing bowl, beat the egg white and vanilla until frothy. Add the pecan halves then toss to coat. Add the sugar mixture and combine to coat. Place on the prepared baking sheet and spread out the pecans. Bake for 1 hour, tossing the pecans on the pan about every 15 minutes. Let cool before placing on top of the pie when ready to serve. If you want to use homemade whipped cream, follow these instructions. In a cold metal bowl of a stand mixer or in a large cold metal mixing bowl with a hand mixer, use cold beaters to beat 1 cup cold heavy whipping cream, 2 tablespoons of granulated sugar and the remaining teaspoon of cinnamon until stiff peaks form. Do not top put on the ice cream pie until you’re ready to serve it. You can make the whipped cream a day or two ahead, just store it in the fridge until you’re ready to serve then lightly beat with a whisk before topping the pie. Another Wednesday, another recipe full of pumpkin-goodness! I have two fairly simple desserts recipes that are both big crowd-pleasers that I’ll be sharing with you in time for Thanksgiving. Spoiler: they both include pumpkin! I love pie at Thanksgiving, but sometimes I want something a little different. 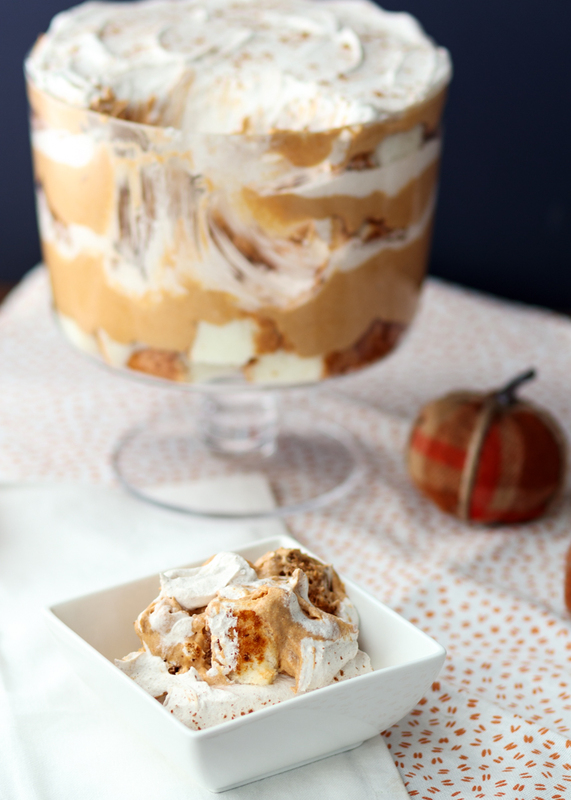 I discovered this Pumpkin Cheesecake Trifle two years ago and it became an instant favorite. 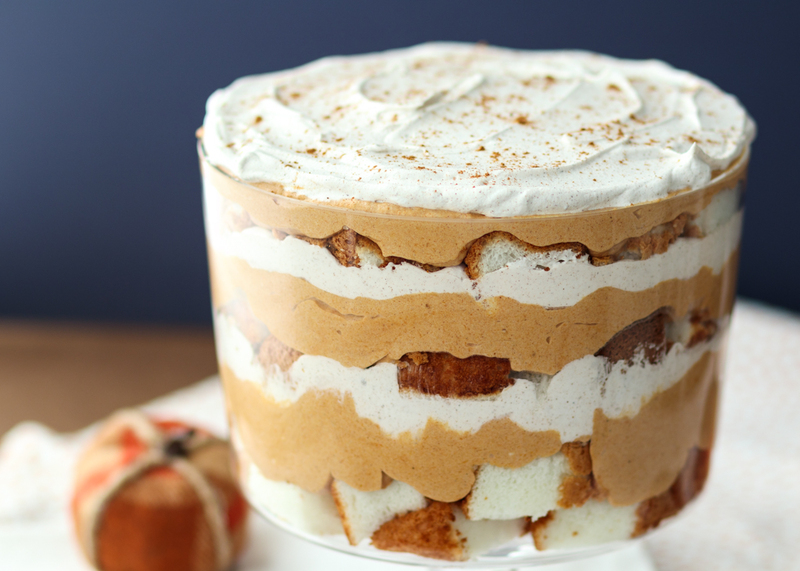 I’m a sucker for a good trifle, especially one that involves angel food cake, because they’re so light, which is perfect for after a big holiday meal. The Summer Berry Trifle is a classic, but I wanted a go-to trifle during the fall and winter months as well. 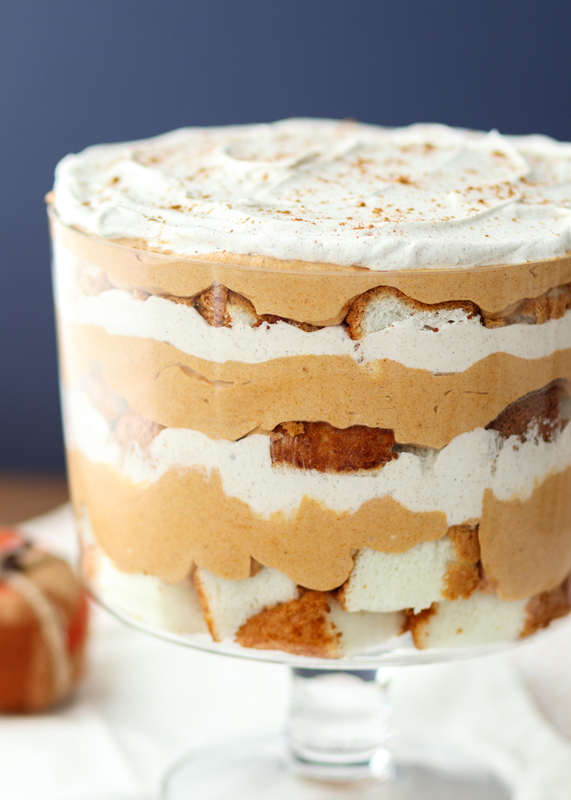 This Pumpkin Cheesecake Trifle recipe is super easy and has just three layers. The first is the angel food cake. You can buy store-bought angel food cake, make it from a box mix or make your own homemade version. 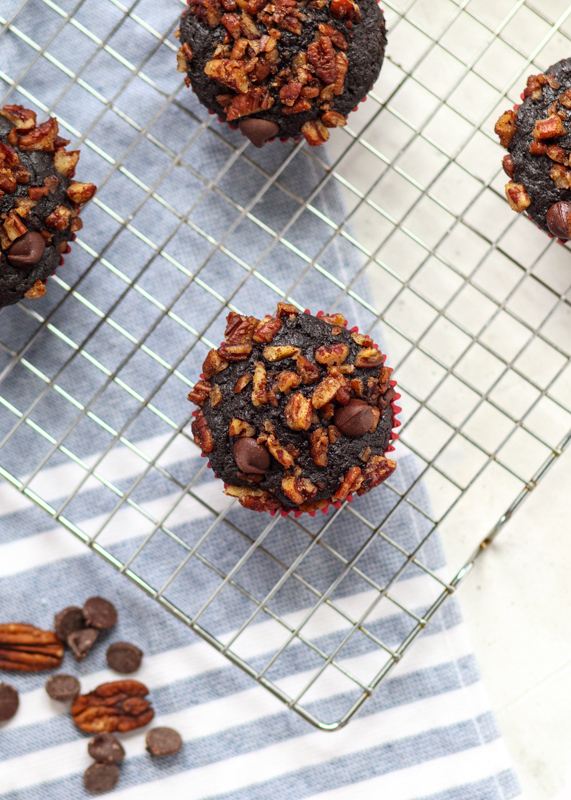 I personally like to stick to the box mix version since you just mix it with water and bake – crazy easy! One of these days I’ll try a homemade angel food cake, but when I’m throwing it into a trifle and busy with other holiday prep the box mix is good enough for me. The next layer is a pumpkin cheesecake filling. Yes, it’s as incredible as it sounds. It’s creamy, warmly spiced and packed with pumpkin flavor. Finally, we have a cinnamon whipped cream because whipped cream is amazing, but cinnamon whipped cream is on the next level. I used whipped topping, but I included instructions for homemade whipped cream as well so feel free to use whichever you prefer! I used this 7.5” trifle bowl from Crate and Barrel, which as you can see is bursting at the top so you could definitely get away with a larger trifle bowl not looking too empty. Or just pile more cinnamon whipped cream on top! Enjoy! In the bowl of a stand mixer or a large mixing bowl with a hand mixer, beat the cream cheese until light and fluffy. Add the pumpkin, brown sugar, vanilla and pumpkin pie spice then beat until combined. Fold in 1⅓ cups whipped topping. 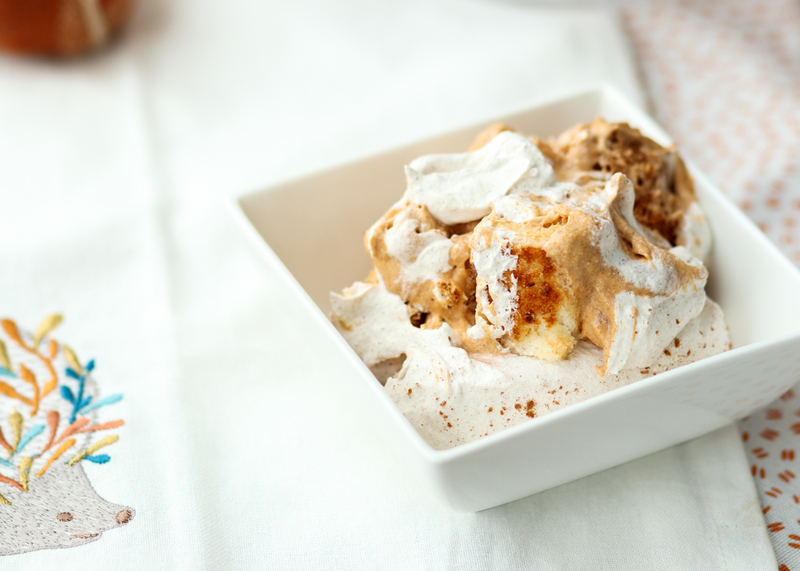 Combine the remaining 2⅔ whipped topping with the ground cinnamon. Layer ⅓ of the angel food cake chunks into the bottom of the trifle bowl. Top with ½ of the pumpkin mixture, smooth into an even layer. 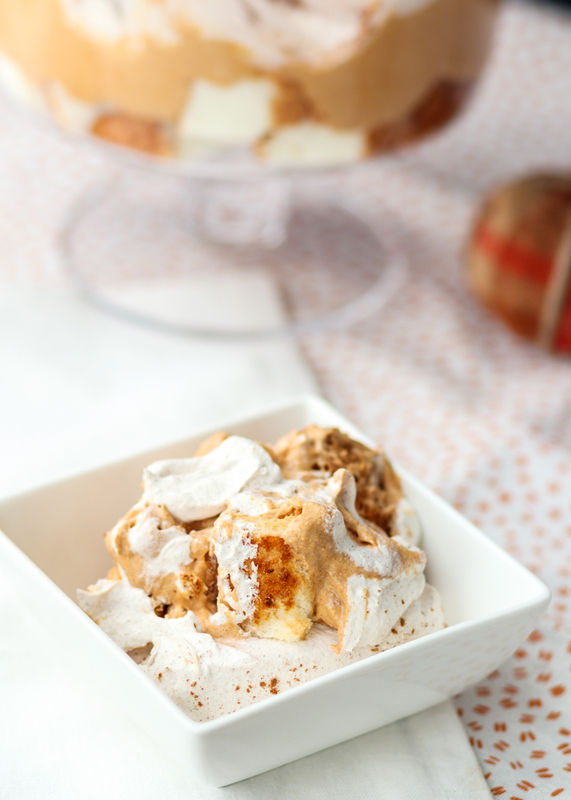 Top with ⅓ of the cinnamon whipped cream, smooth into an even layer. Repeat the layers two more times so that you end with the whipped cream on the top. Sprinkle with a dusting of pumpkin pie spice then refrigerate until ready to serve. If you would prefer to use homemade whipped cream instead of whipped topping, you will need 4 cups of whipped cream. Beat 2 cups of cold heavy cream with ¼ cup granulated sugar and 1 teaspoon ground cinnamon until stiff peaks form. Box mix tip: I don’t have an angel food cake pan so when I make the box mix for this recipe I use a 9x13” pan. I put parchment paper on the bottom then bake it at 350 degrees F for 35 minutes. The top should be golden brown and not sticky. Then turn the pan upside down using 4 cans of the same height under each corner and let it stay like that until it cools. Once it’s mostly cooled, run a butter knife around the edges then the cake should fall right out. Recipe slightly adapted from Mom on Timeout. November already? 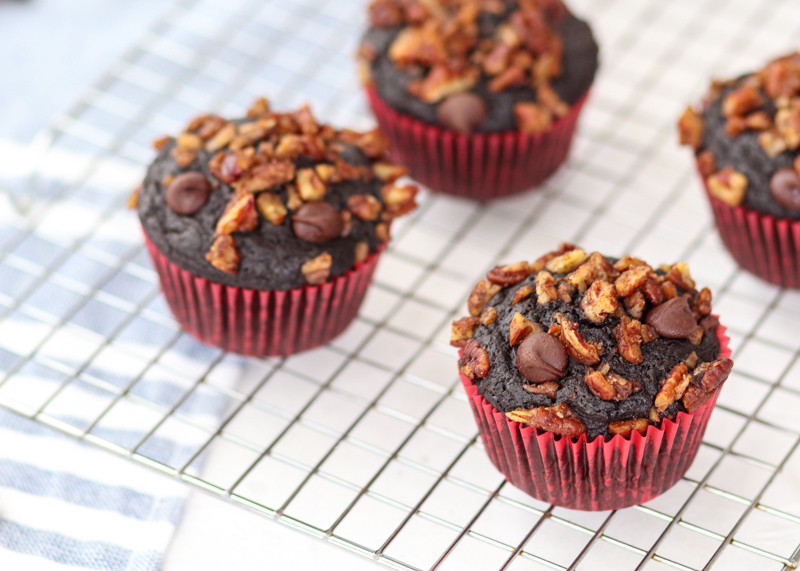 I’m here to sweeten your Friday with these Double Chocolate Pecan Muffins! Another monthly muffin post, except there’s something different about this one. This is not the Food Network Magazine’s November muffin recipe. 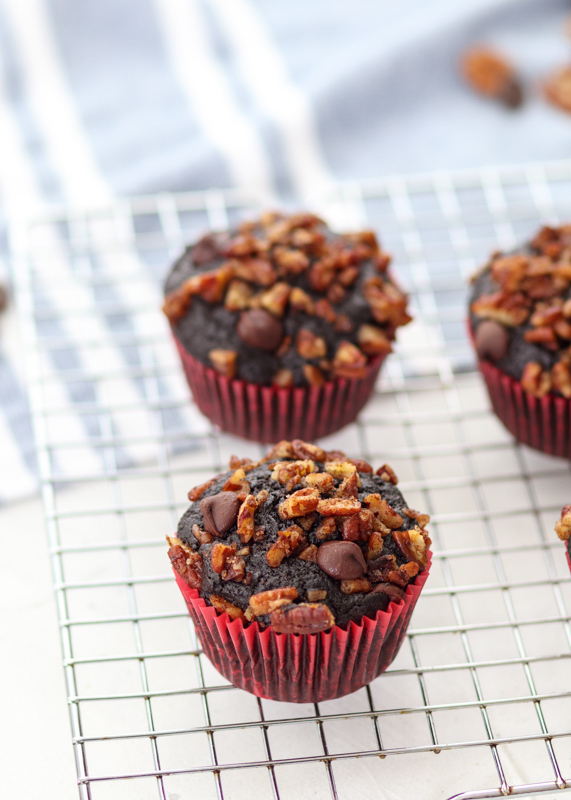 Theirs was a corn chestnut muffin that Matt and I could not get excited about so I made these Double Chocolate Pecan Muffins instead! I used the base from February’s Double Chocolate Salted Caramel Muffins since they were extra chocolatey and moist. Then I add some cinnamon and brown sugar spiced pecans to the top that you can whip together in a small mixing bowl. 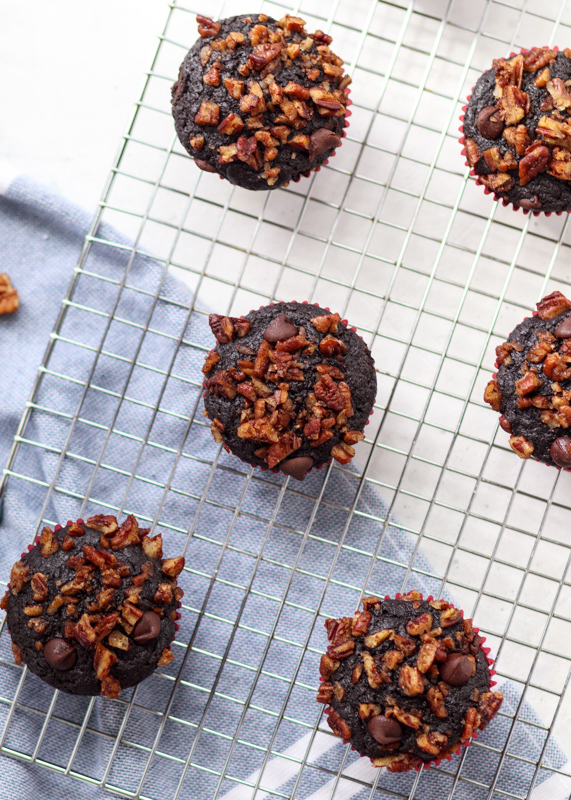 The inspiration for these November muffins came from my love of chocolate pecan pie – see recipe for Mini Molten Chocolate Pecan Pies – but way easier and perfect for eating for breakfast. There’s a few things I miss about college, but one of the biggest is their dining hall food – is that weird? Every once and a while Boston College would have slices of the most amazing chocolate pecan pie in to-go boxes and I always had to get it, and maybe a second one for my mini fridge. 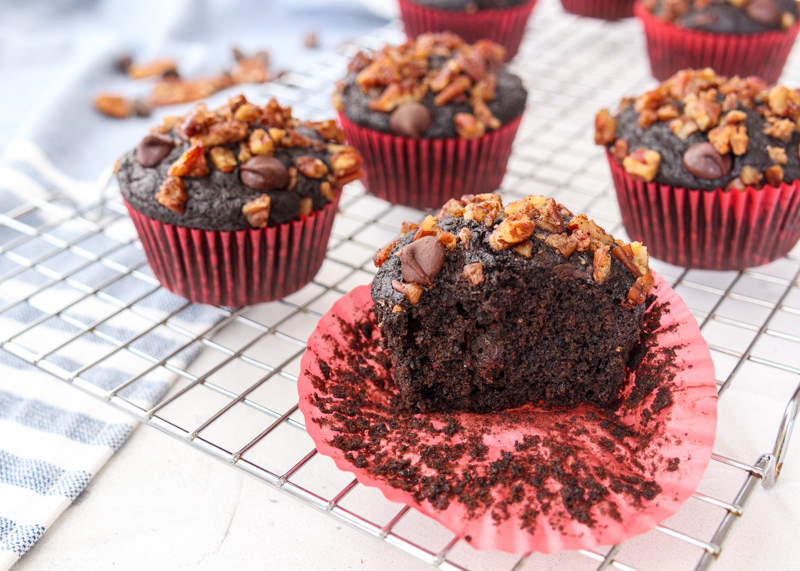 As you know I have a hard time parting with chocolate treats and I begrudgingly shared these muffins, but I’m glad I did because everyone really liked them! Also, because then I would have eaten them all so basically a win-win all around. 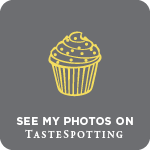 It’s also fitting to be posting these for the November Muffins since Diane’s birthday is later this month and my stepmom loves chocolate pecan pie – big emphasis on the chocolate! I hope you all love these muffins! I don’t like the sound of December’s muffin either so I have something in the works for that one, too. Think savory like March’s Irish Cheddar, Bacon and Potato Muffins – yum! Did any of you make the Food Network Magazine’s November muffins? What did you think? Also, don’t forget to turn back your clocks this weekend. Fun fact – Japan hasn’t observed daylight savings time since 1951, but they are considered adopting it for the 2020 Olympic Games. Okay, that’s all I have for you today, happy Friday, friends! Preheat the oven to 375 degrees F. Line a 12-cup cupcake pan with paper liners and set aside. In a small bowl, combine the chopped pecans, melted butter, brown sugar, cinnamon, nutmeg and pinch of salt. Set aside. In a large bowl, sift together the flour, sugar, cocoa powder, baking powder, baking soda, and salt. Add the chocolate chips and stir to combine. In a small bowl, whisk the eggs. Add the milk and vegetable oil then whisk until smooth. Pour the egg mixture into the flour mixture and stir until just combined. Evenly pour the batter into the prepared paper liners. Each muffin cup should be filled ⅔ to the top. 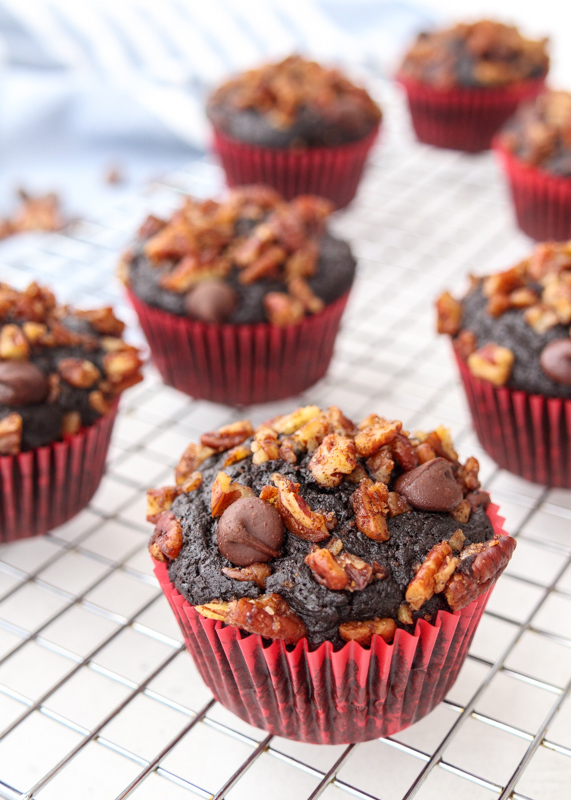 Bake for 2 minutes then remove the muffin pan from the oven and working quickly, spoon some of the pecan mixture into the center of each muffin. Return the pan to the oven. Continue to bake for 16-20 more minutes, or until a toothpick inserted into the muffin comes out with just a crumb or two. Let the muffins cool in the pan for 5 minutes then move the muffins to a cooling rack until completely cooled. Happy Halloween, everyone! 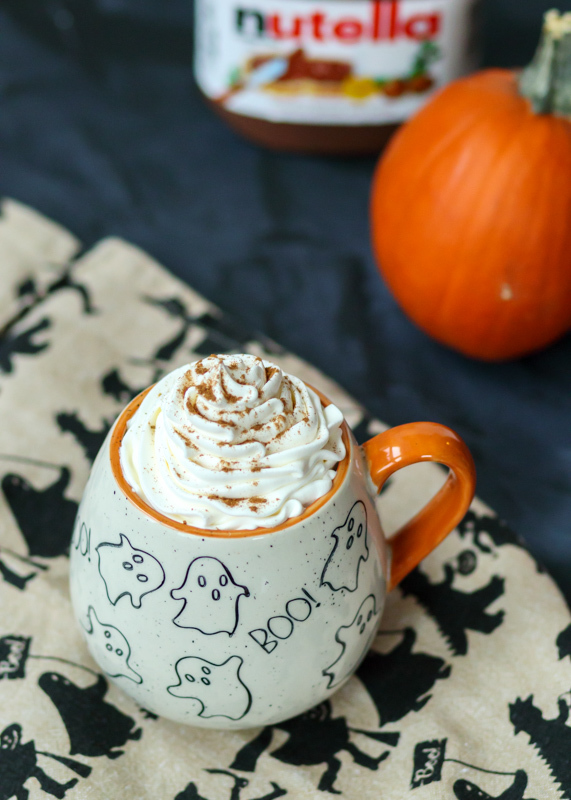 I wanted to send out a quick post to wish you all a Happy Halloween and to share an easy and creamy hot chocolate recipe. 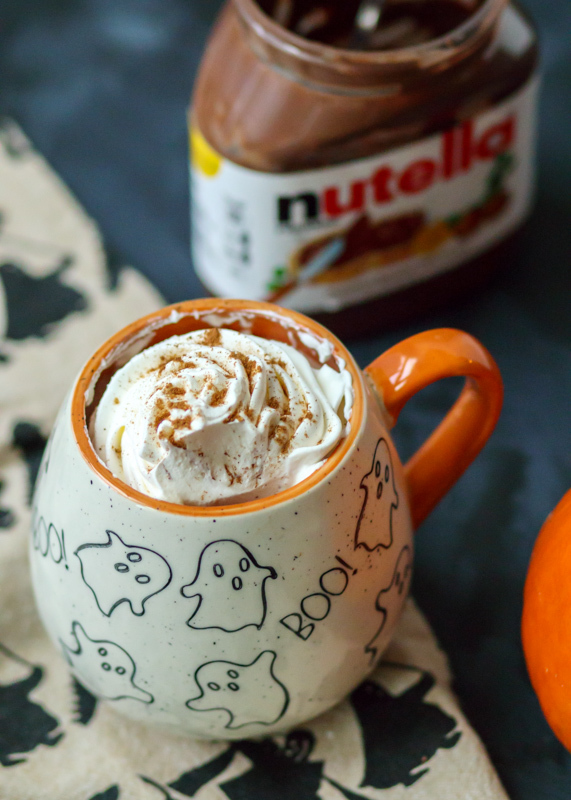 This Boozy (or non-boozy) Pumpkin Nutella Hot Chocolate is perfect for staying warm while passing out Halloween candy or for pouring into a to-go mug to sip on while taking your kids trick-or-treating. A couple years ago I shared my Spiked Hazelnut Hot Chocolate, also known as when I discovered you could combine hot milk and Nutella to make a irresistible homemade hot chocolate. Mind still blown! This year I’ve added some pumpkin puree and pumpkin pie spice since I’m about all things pumpkin in the fall. 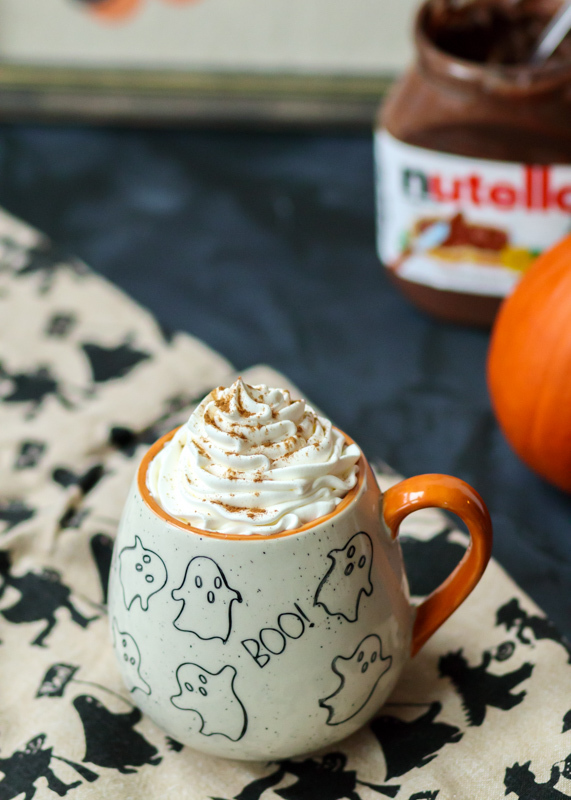 Both the chocolatey Nutella and the warming spice of the pumpkin come through and the whipped cream on top is key for making it extra cozy. I tried to slowly sip on mine to make it last, but as soon as it got cool enough next thing I knew my mug was empty. I love the extra depth of flavor the pumpkin adds to the hot chocolate so I’ll probably be making this one all hot chocolate season long. Yes, hot chocolate season is a thing! 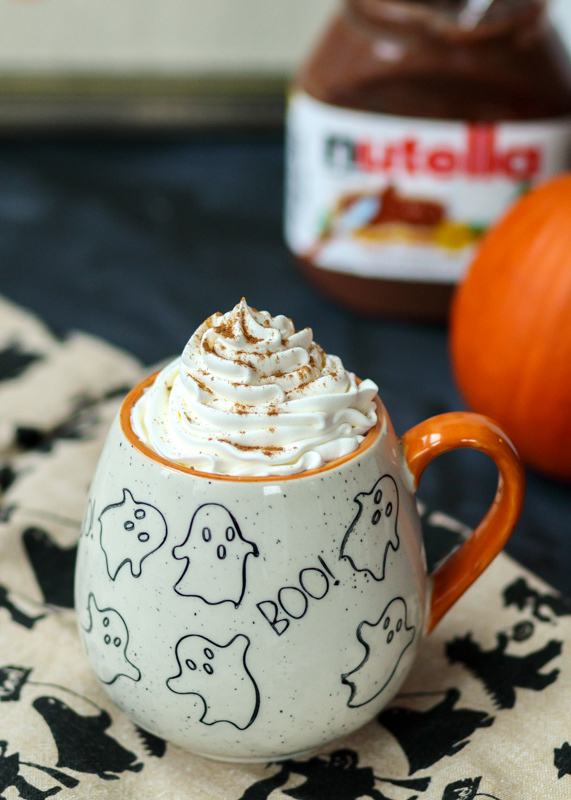 You can keep this drink alcohol free for the kids and non-drinkers or you can turn it into Boozy Pumpkin Nutella Hot Chocolate. 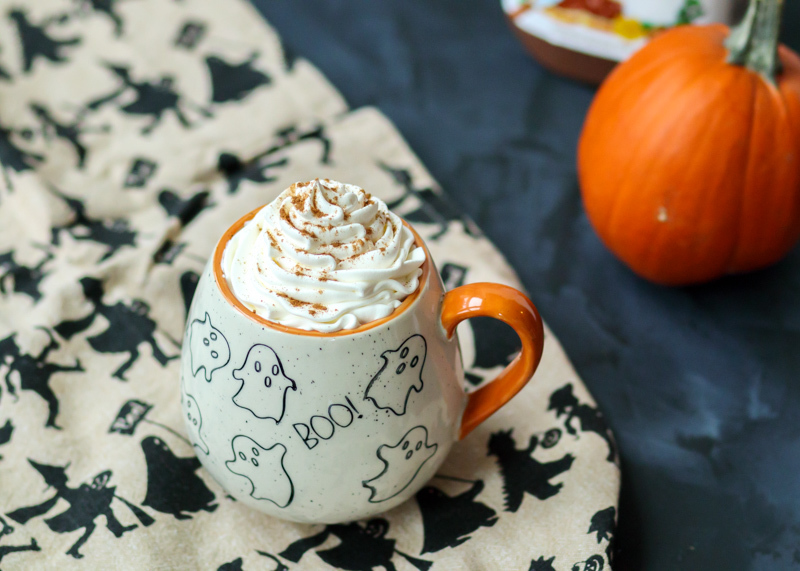 My original Spiked Hazelnut Hot Chocolate recipe called for some hazelnut liquor, like Frangelico, but apparently there is a pumpkin spice Kahlua that tastes really good according to Adam Rippon that would taste so good in this boozy hot chocolate. The recipe below only makes one, but I have a feeling you’re going to need to multiply that so you can share! Just a reminder that I’ll be in Japan starting today for the next week and a half so if I don’t get to your comments or emails right away that is why. <Insert all the excited and sushi emojis here!! !> I hope you all enjoy today and tonight with your family and friends! What are your plans for Halloween? Let me know in the comments below! 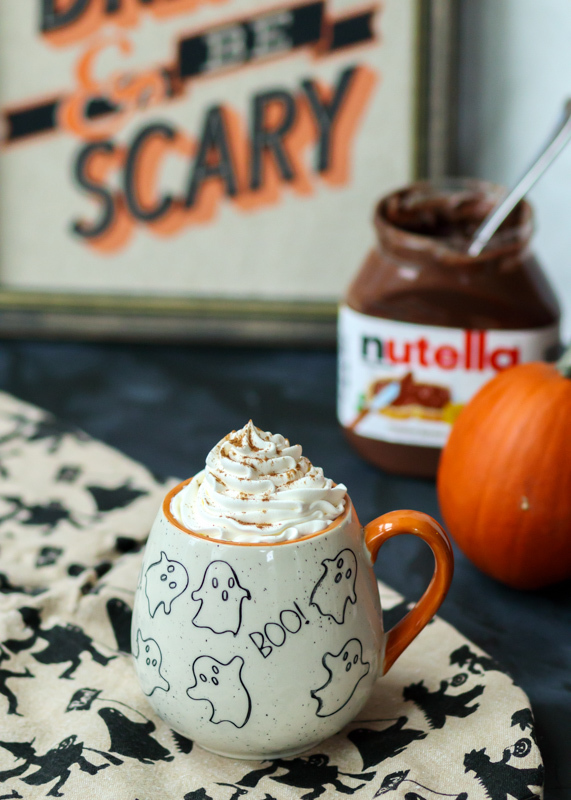 Maybe making this Boozy Pumpkin Nutella Hot Chocolate?! Heat the milk on the stove top or in the microwave until lightly steaming. Add the Nutella, pumpkin puree, liquor (if using), and pumpkin pie spice. Whisk until smooth. Top with whipped cream and a light dusting of pumpkin pie spice. You can use any type of milk that you prefer.